Throughout all facets of modern manufacturing, innovation is a central principle—this is what separates good companies from those that are truly great. While it’s difficult to forecast the ebb and flow of business, oftentimes more open-minded and imaginative companies are the ones gaining new contracts. Inspiration can strike at any moment and in diverse forms. Industrial designers and manufacturers overlook this point from time to time, and as a result, many of their ideas are placed into a rigid, often uninspiring framework. Other times, people hold ideas back because they’re afraid of looking foolish in the eyes of their peers or customers. If you plan to not only survive, but thrive in today’s ever-changing global market, you must learn to embrace your creativity. Instead of dismissing ideas that seem too far-fetched, take the time to dwell in the moment. You can never tell how far an idea will take you. Two years ago, the Northeast region of the U.S. faced a bitter, unforgiving snowstorm dubbed the Blizzard of 2013; in some areas, the snowfall actually reached 40 inches. The blizzard led to several school closings, which confined several children to their homes. Sydney Blair, 12, was among those affected by a school closing. While many of her classmates were thrilled to be on an extended break from their studies, Sydney had an opposing view of the situation. She liked spending her time balancing her interests of academics and dance—until the snow became a hindrance, of course. One day, intending to get her out of the house, Sydney’s mother sent the young girl to visit her father at work. It just so happens that her father was Chad Blair, the president of RT Engineering—one of the Northeast’s most trusted providers of custom industrial solutions. At the RT facility in Franklin, MA, Sydney’s imagination took shape in the form of a unique, and very clever idea. 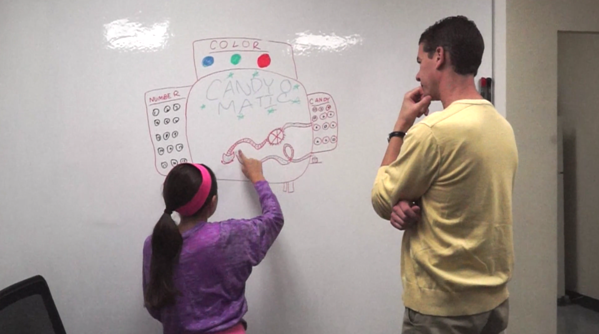 Armed with a dry erase marker and a boundless jubilance, she began conceptualizing this idea—the Candy-O-Matic Machine. Sydney’s rendering of her candy machine got the attention of her father, and the entire RT Engineering team. They stood enthralled, eagerly awaiting her explanation of the machine’s functions. The Candy-O-Matic is essentially a candy sorting machine that provides different colored candies depending on the preference of the user. While some people might think only a child would find this idea appealing, the RT team was quick to support the young inventor-in-training. The next step was to figure out how to make the idea work. 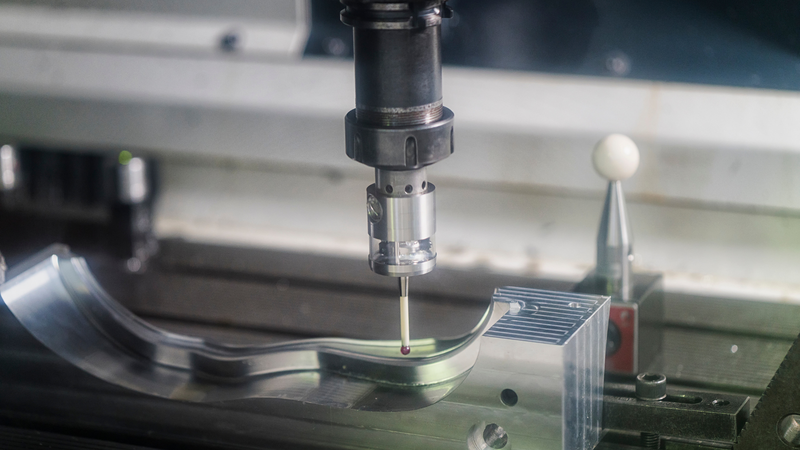 The machine utilizes vision systems—a technology that is becoming more popular in many modern industries. With its internal camera, the Candy-O-Matic snaps an image of a desired candy, and compares it to a master image; this comparison helps the machine differentiate between candy colors, as well as reject candies that are of poor quality. After three months of production, the Candy-O-Matic became a reality. Seeing her idea unfold exactly as she envisioned it, Sydney leapt into her father’s arms, overjoyed and proud of the team’s accomplishment. RT is always dedicated to the interests of our customers. Prior to starting a project, we always sit with and ask people to tell us, in their wildest dreams, what they want their machine to do. We can always scale back if need be, but if we don’t know what your expectations are, how can we nurture your creative ideas? At RT Engineering, we encourage our customers to dream big—with our support, there’s no goal that can’t be attainted. For more information about our services and capabilities, please visit the following links. RT would like to thank its supplier partners for their generous contributions and their help in making the Candy-O-Matic project a reality.